The PESA Supply Chain Committee holds quarterly roundtable events educating PESA member companies on the various trends, challenges and solutions affecting domestic and global supply chain functions. 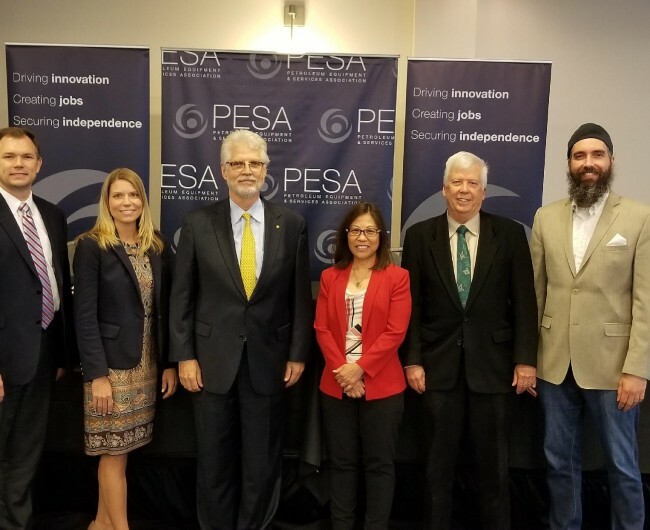 The most recent roundtable, Trade Regulations, Tariffs, and the Potential Effects on Supply Chain, was held on May 11 and jointly hosted by the PESA International Trade Policy Committee. Panelists included Jim Owsley, Vice President, Supply Chain, DistributionNOW; Kartapurkh Khalsa, Senior Counsel and Director of Customs Compliance, NOV; and PESA Advisory Board Member Doug Polk, Vice President, Industry Affairs, Vallourec. Brad Wise, VP Marketing, DistributionNOW, moderated. This past March, the Trump Administration imposed a 25% tariff for imported steel and 10% tariff for aluminum under Section 232 of the Trade Expansion Act of 1962. PESA has actively engaged this topic and the two committees developed the roundtable to address this critical issue. To open the event, Doug Polk shared insights on seamless steel imports as an integral part of the U.S. market, illustrating with regional import data. Polk shared that between 2015-2017, the U.S. imported a high percentage of steel from numerous countries around the globe, noting the high dollar volume coming from the EU. Polk then addressed Section 232, a mechanism under the Trade Expansion Act of 1962 that allows the U.S. government to evaluate the effect of imports on national security. He explained that Section 232 is possibly being used as a mechanism to implement change in the relationship between the US and the World Trade Organization (WTO). To receive product exemptions from the steel and aluminum tariffs, organizations are required to submit exclusion requests to the U.S. Department of Commerce, providing information about their product. As Polk explained in the conclusion of his address, Individual countries can file for exemptions as well. He reiterated the importance of organizations filing product exclusions and perhaps even more importantly, taking advantage of the comment period. “It’s important to make recommendations on behalf of the sector,” he said. Owsley then segued into an overview of the effect Section 232 has had in the United States and the global price increases of such steel substances as hot roll coil. Owsley shared what is covered by the investigations, the 2017-2018 timeline and current questions that remain for Section 232. Owsley also spoke to Section 301, an investigative mechanism being used to determine whether China’s acts, policies, and practices related to technology transfer, intellectual property, and innovation are unreasonable, unjustifiable, or discriminatory and burden or restrict U.S. commerce. Concluding his presentation, Owsley shared recent trade cases his organization, DistributionNOW, is following and advised on best practices for reshaping the supply chain. He stressed the importance of flexibility and adaptability, making sure to prepare viable alternatives. Khalsa touched upon Section 232 as well, sharing the Request for Exclusion from Remedies: Section 232 National Security Investigation of Steel Imports document with the attendees. He provided a comprehensive overview of the form, explaining sections that have proven to be difficult and ambiguous for companies. In closing, Khalsa shared a letter his organization, National Oilwell Varco, submits along with every Request for Exclusion from Remedies document. This letter, addressed directly to Secretary Wilbur Ross, Secretary of Commerce, explains and stresses the importance of being able to import specialty steel products from abroad and how the imposition of the steel tariffs will have a significant negative impact on NOV’s domestic manufacturing operations. “Think about how you want to engage your Congressmen, your Senators, and the value-add they can bring by putting the tension on the Department of Commerce for your specific requests,” said Khalsa. PESA’s International Trade Policy Committee has led PESA’s recent actions regarding the Trump Administration’s proposed tariffs under Section 232 of the Trade Expansion Act of 1962. PESA also continues to engage with the Alliance for Competitive Steel and Aluminum Tariffs (ASCAT) which represents steel and aluminum downstream users and U.S. exporters. In May of this year, PESA joined the National Retail Federation and more than 100 other associations representing U.S. retailers, manufacturers, farmers, agribusinesses, technology companies and other supply chain stakeholders submitting comments to Ambassador Robert Lighthizer, U.S. Trade Representative, outlining how the administration’s proposed tariffs on $50 billion worth of Chinese imports would harm the U.S. economy. The groups urged the administration to instead develop a comprehensive strategy to effectively address China’s unfair trade practices by aligning with Congress and like-minded trading partners. PESA will continue to follow these escalating tariff threats and work in conjunction with other associations to advocate on behalf of the specific needs of the service and supply sector. Developing Culture Roundtable: How Does the Industry Change?